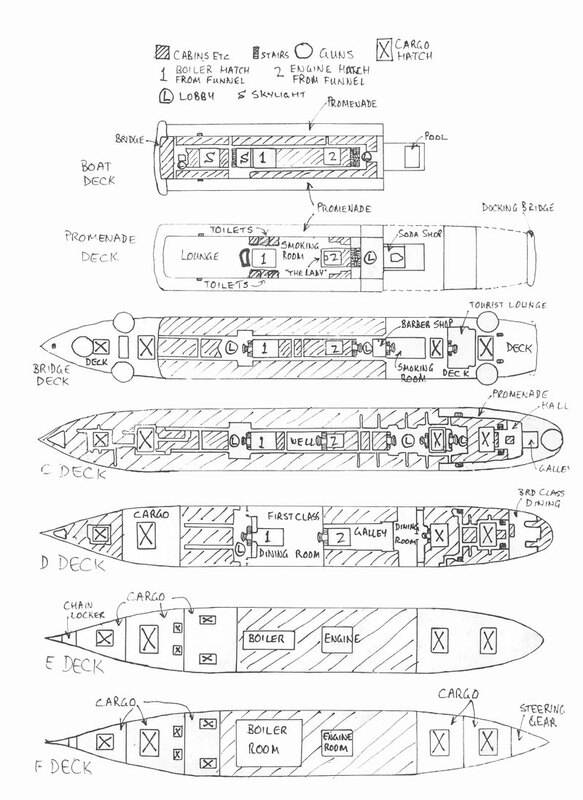 Note: For more information on the history and sinking of the Coolidge, see the Main Coolidge Index. As you drop below the surface and start descending along the thick rope that connects the bow to the shore, your first sight is of a difference between light and dark. At ten metres you can now ascertain that the darkness is the hull. At 15 metres you are just metres from the bow. Your first thought is that this really is a huge wreck. Your guide leads you across the bow towards the stern and the depth gradually increases. Ahead you see winches and huge guns, then a mast and its cranes. Amazing! It is a breathtaking sight that confronts you. Ahead is the enormous bridge, stretching all the way to the bottom at more than 40 metres. To your right runs a jumble of huge masts and above you there is a huge gun emplacement and below you, yet another gun. The masts themselves disappear out of sight, angled down towards the sand. This is really a lot bigger than you imagined. Your first dive on the wreck has vastly changed your views on what to expect. This is the SS President Coolidge, the largest easily accessible shipwreck in the world. As I indicated above, there is only one word to describe diving the SS President Coolidge, AWESOME. When you descend to the bow you see that this is indeed a huge ship, but it is really not until you swim further back along the hull and drop from the hull past the deck towards the sand almost 30 metres further down that you begin to appreciate its enormous size. 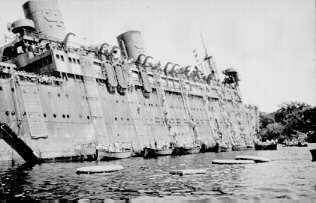 Out of the dark huge shapes emerge, the bridge, masts and crane arms, enormous cargo holds, anti-aircraft guns, anchors and winches, far too much to examine in even a dozen dives. The minimum depth for even a basic dive on the Coolidge is 33 metres, so we are talking deep diving. However, do not let this put you off diving the Coolidge, as deep diving on the Coolidge is not like deep diving off Sydney or Melbourne. It is a lot easier here, the water is warmer, the visibilty (usually) better, no rough seas and little if any current. Even novice divers can dive safely here and still see lots. There are numerous dives that you can do on the wreck. This page gives links to the standard (and not so standard dives) on the Coolidge. A lot of the dives do one or more of the individual parts that I explain. Remember, the ship is on its port side so all references to the back of a hold really refer to the bottom of the hold, the right refers to the rear and the left refers to the front. Likewise, nearly every dive on the wreck is a decompression dive. Deco ranges from a minute or two on the afternoon dive to up to 30 minutes on the very deep morning dives. Deco is done in the shallows next to the reef. This is very interesting and there is always something to see. See the separate article on the deco stop. Aquamarine Diving and Santo Dive both do shore and boat dives. You can choose to do either boat dives or shore dives or a combination of both. Boat dives are especially good for deeper morning dives. Shore dives are fairly easy and not too troublesome. There is a rope that runs from the shore near the deco stop to the bow.